We’ve had a pretty nice summer here in NYC so far. This is the first week where I’ve felt just a little too hot. One of my challenges is to stay hydrated in this kind of weather. Frankly, I find water pretty boring. It’s an effort to drink enough of it on a hot day. Fortunately there are several herbs that make lovely infused water that requires almost no effort at all. First on the list is peppermint. Cooling and stimulating it makes a great drink for an active day. Second is ginger root. It’s just a little fiery when made as a cold infusion. I like to add some honey for sweetness. Third, and probably my favorite, is lemon balm. 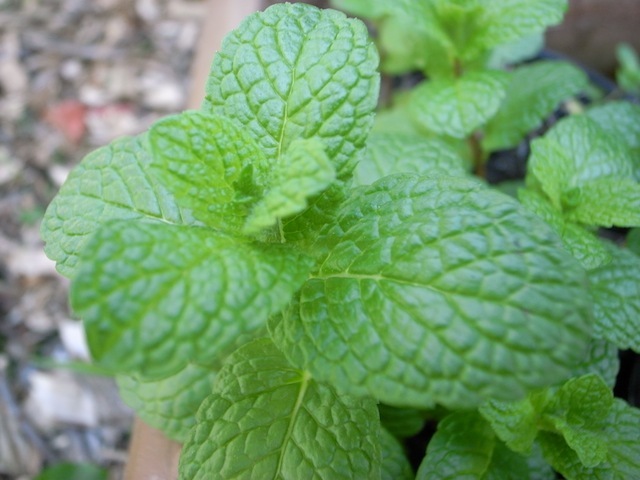 It’s a member of the mint family but is very mild and calming rather than stimulating. It has a delicate flavor and just a hint of sweetness to it. All of these herbs are great for the digestive system. Peppermint and ginger stimulate the appetite and the flow of digestive juices and they both relieve nausea. Lemon balm is very soothing and relaxing to the digestive tract, easing any distress in the stomach. It also soothes the mind and can be taken at night to aid sleep. To make a cold infusion chop fresh herbs and place in a mason jar or coffee press. Fill with cold water and allow to steep overnight. The next day strain the herbs out, add any sweetener you might like and store in the refrigerator. The infusion will last for 3-4 days refrigerated. Use 1/4 -1/2 cup fresh herbs per quart of water depending on how strong you would like your infusion. I usually make it strong and then add more water later for a milder taste.